OTC Beta 8 with New and Improved Buyout Mode is Now Available! with the new "No Buyout!" 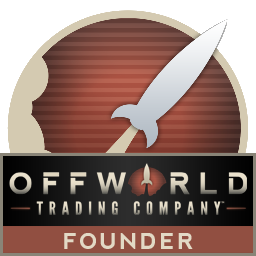 Mode in Offworld Trading Company Beta 8! The new "No Buyout" mode makes it so that rival corporations must buy out your shares one at a time instead of all at once. When your shares are out, you are eliminated from the game. New stock mode: “No Buyout!”, new music, and leaderboards for multiplayer! No Buyout mode (on by default): Rival corporations can buyout your own shares one at a time. Once your own shares are gone, you are eliminated from the game, and your corporation becomes a subsidiary of its shareholders, who then receive a dividend from your old company three times a day. When you buyout yourself, other players get double values of the shares as cash. Offworld prices raise slowly throughout the game. Energy Vault now fills automatically at 1 unit per tick. Engineering Lab is now called the Upgrade Lab. Patent Office is now Patent Lab. Pleasure Dome and Hacker Array can only be built at level 3. First Offworld Market can be built at level 4, and the second one can be built at level 5. Fixed a number of bugs involving buying stock in a team game. Added better, more thematic events. Fixed for how adjacency is calculated. Adjusted difficulty at lower settings and in the tutorials. Added terrain regions to scanning phase. Improved AI for placing Pleasure Domes. Will auction tiles near the colony for Pleasure Domes. Expansive HQs now have a higher entertainment demand than Scavenger HQs. Added some AI quips from various events. Player buy percentage now include resources stored in orders (like launches and research). Only the lobby owner can change the difficulty and team settings in a custom game. Added lost communications messages to loading screen in case we lose communications to the server during the game load. New Glass Furnace model and construction animation. New Upgrade Lab construction animation. New Solar Condenser model and animation. New Dry Ice Condenser animation. New scientific version of Electrolysis Reactor with animations. New leaderboards with rankings on the quickmatch menu. In team game, when your teammate is in danger of being bought out, a percentage number shows up next to their name. When a building or claim is in progress, meaning that a vehicle is moving to do the action, it appears in the list at the top of the screen. While it is in transit, you can right click on the button to cancel it. Fixed not showing “off” when a building is virused. Removed player dropdown from summary screen. Charts & graphs screen now shows all players when appropriate. Added colony stock purchase button for 7 Sols mode. During found mode, grey out undiscovered resources. Fixed incorrect resource level showing on UI when player has slant drilling. Putting active player at the top of the player list at game start. You can now click on the alerts in the top right to pan the camera to the location that is associated with the event. Fixed a bug where reveal map text was not being rendered at certain resolutions. 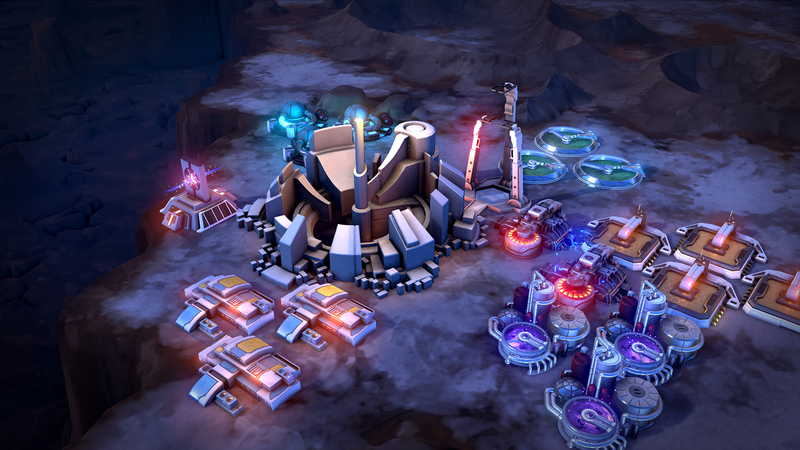 Tile tips for scientific don't point to tiles adjacent to the HQ for factories. Black market buttons slightly improved. Removed false-positive state. Selected tile UI betrays a hologrammed building 100% less. Added loading screen to the game. Saving skirmish setting file so it persists between games. SHIFT-A will skip auctions in single-player. Can now fast forward during replays. Fixed achievements with the campaign. Two new in-game dynamic songs and a new version of the existing one. Added new building construction sounds. Selecting a building to construct plays a click sound. Added audio for reveal map mode when money and credit ranking is dropping.